New Bee label: coming in 2014 to a pesticide label near you! Many SW Kansas residents have voiced concern over our local bee populations (or lack there of!). I have received calls from homeowners, not complaining, but actually rejoicing because they have spotted a honey bee or bumble bee in their yard! 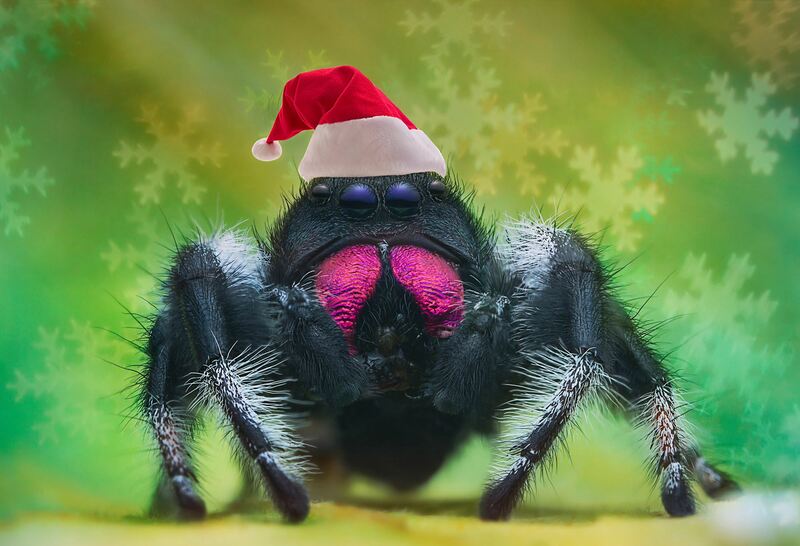 Its rare that I hear from someone who has found an insect and is super happy about it! Honey bees and other insect pollinators have been steadily declining because of habitat loss, parasites and disease, genetics, poor nutrition and pesticide exposure. An estimated one-third of all food and beverages are made possible by pollination from honeybees and other pollinators. Pollination is worth more than $20 billion in agricultural production annually (http://www.usda.gov/documents/ReportHoneyBeeHealth.pdf). Thanks to the outpouring of concern over bee decline in the last couple of years in the US, the government is taking action to help the bees by creating this new label. The new “Bee hazard” label is simple, yet can be readily seen and recognized immediately by pesticide applicators. The new labels will not only sport the new “bee icon” (see above pic) but will spell out information on routes of exposure and spray drift precautions for bees and other insect pollinators. The warnings are not limited to just honey bees, but encompass “bees and other insect pollinators”. This new label will be on products containing the neonicotinoids imidacloprid, dinotefuran, clothianidin and thiamethoxam. Helping pesticide applicators be aware of the hazards is only part of the battle to save our pollinators. Creating pollinator friendly habitats around our homes, farms and businesses and being mindful of pollinators when using home or garden pesticides will also make a big difference to our little friends. 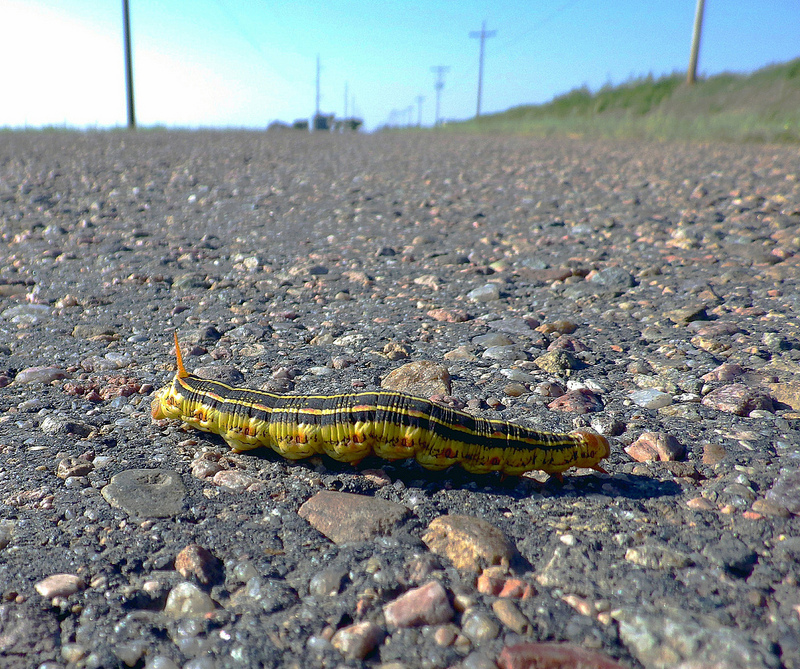 Why did the White-lined sphinx caterpillar cross the road? The last couple of weeks, these caterpillars have been seen roaming the streets in SW Kansas. It’s hard to miss these finger-sized, brightly colored worms as they cross the road by the hundreds. So why are they crossing the road? To get to the other side where there is more food, of course! Many producers are spraying herbicide in and around fields in preparation for planting fall crops. The white-lined sphinx eats Kochia, pigweed and various other weed species which are common nuisance species in fields and pastures. Once the caterpillars’ food declines from the herbicide, the insects will migrate to the nearest green patch looking for food. Most of the time, these caterpillars will completely ignore crops and will concentrate on these weedy plant species. 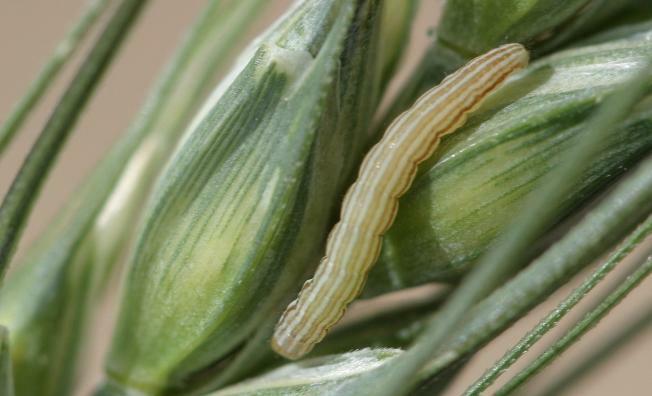 There are a few reports in the literature that recount brome grass as an occasional target of these caterpillars. Because of this, these caterpillars are generally regarded as beneficial! 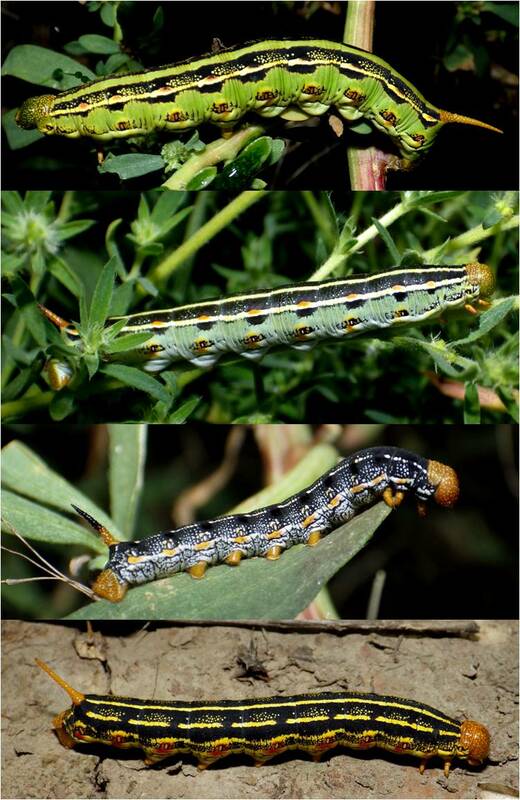 The white-lined sphinx caterpillars can have variable patterns and colors. 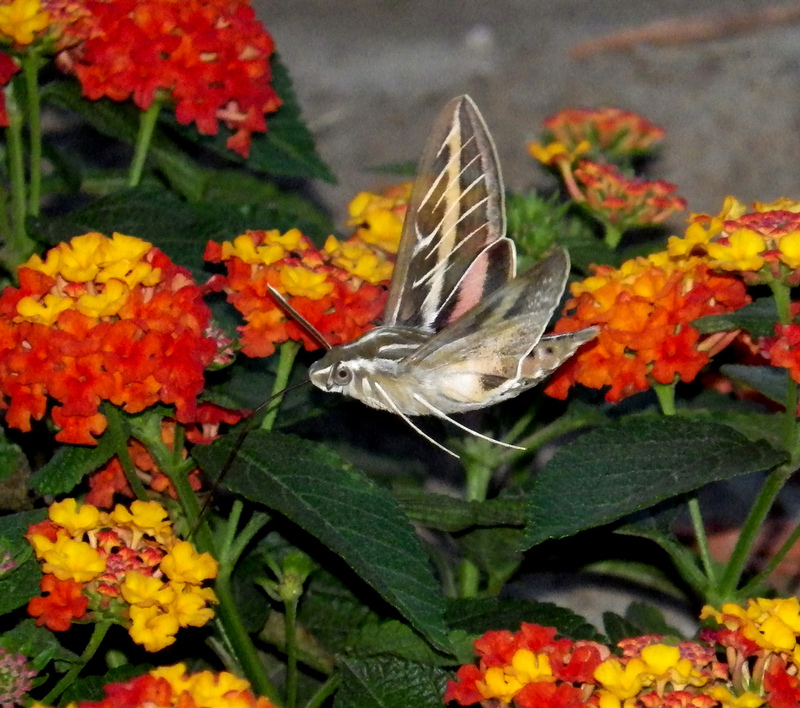 The adults of the white-lined sphinx are very pretty moths that resemble hummingbirds. They can be spotted dashing about, stopping only for brief moments to nectar on flowers. These moths are common at dusk as well as during the day. The National Science Foundation has named Kansas State University as its lead institution for the world’s first Industry/University Cooperative Research Center on wheat. 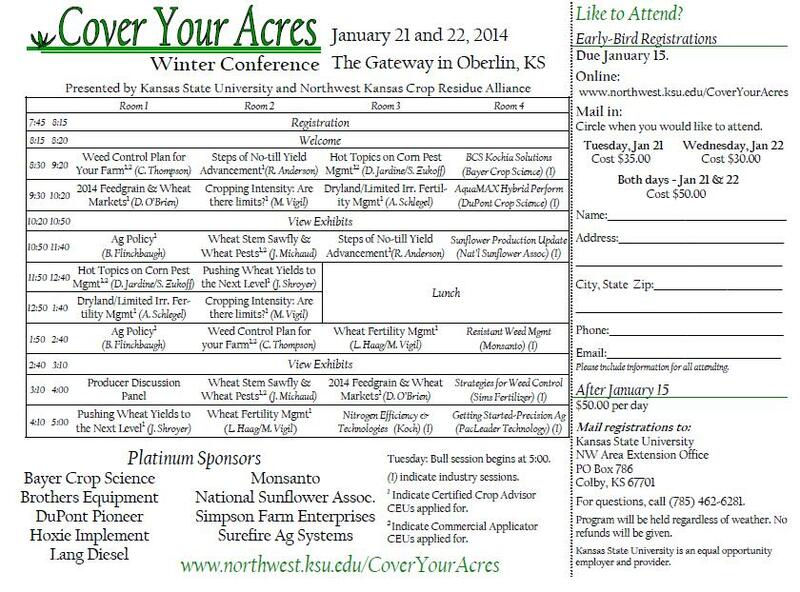 **This involves Kansas State University’s departments of agronomy, plant pathology, entomology and grain science and industry. 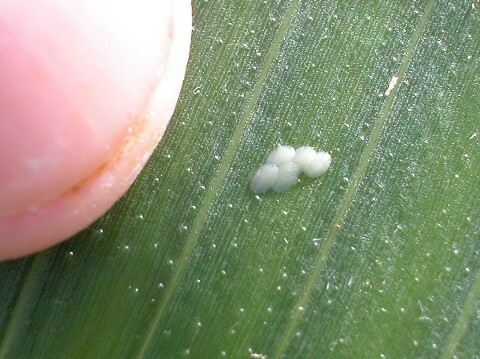 Southern counties across central and southwest Kansas are reporting high numbers of southwestern corn borer egg masses and are treating those fields now. First-generation infestations begin in late June and consist of dark-spotted white worms that feed for five to 10 days on leaf tissue in the plant whorl, then move downward to begin tunneling within the stalk. The second (and most damaging) generation occurs in August. Adult moths begin emerging and laying eggs starting around July 15 to July 23, with egg-laying reaching a peak somewhere between Aug. 1 to Aug. 15. The exact time of the beginning and peak of egg-laying is influenced by weather and geographic location. Eggs are deposited on leaves primarily in the ear region. Newly hatched larvae begin feeding on leaves, but prefer to feed on ear shoots, husks, and silks. Within 10 to 12 days, this generation also begins tunneling within the stalk, generally below the ear zone. 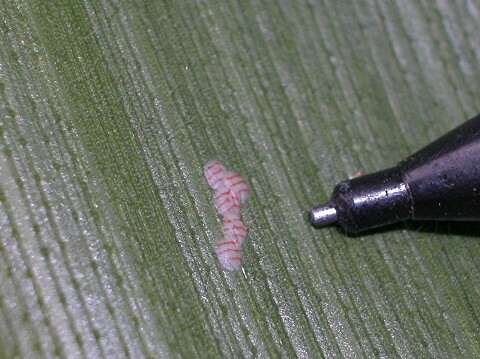 Insecticide applications should be considered on susceptible corn hybrids when 20 to 25 percent of the plants are infested with eggs or newly hatched larvae. Most corn was planted late in Kansas due to the late cold weather, so these fields could become heavily infested. 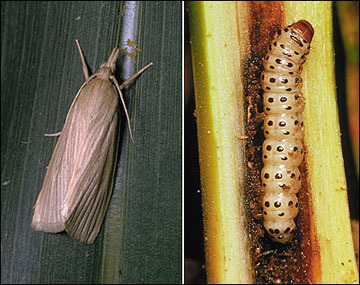 Lodging, caused by girdling of stalk by the larvae, can be avoided if the corn is harvested before girdling begins. However in late planted fields, this is harder to achieve unless the corn is used for silage. Eggs of the second generation are deposited at the ear zone or a node above or below the ear. A female moth is capable of laying 100 to 400 eggs in her short lifespan (approximately 5 days). 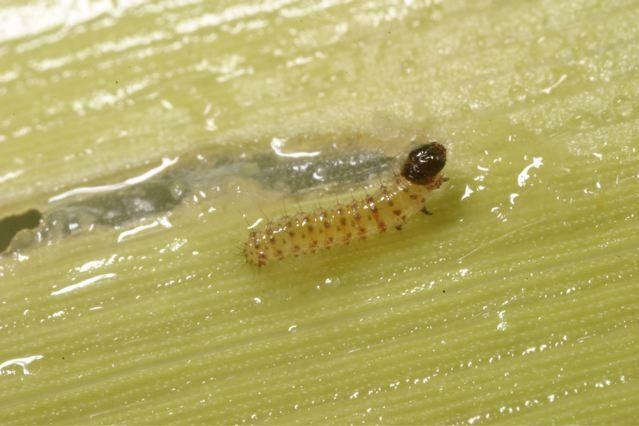 NOTE: Corn hybrids containing European corn borer targeted Bt toxin should control both Southwestern and European corn borers, however, research suggests some Bt types are less effective for Southwestern corn borer control, therefore scouting fields that contain these Bt genes is important as well. K-state Efficacy trials in the past have shown that varieties in the Yieldgard family and Herculex family (see handy Bt table link below) work well for the second generation of SW corn borers, but may not provide 100% protection for the first generation. Since there are many new Bt products targeting moth larvae (Lepidopteran-above ground Bt) available today, K-State efficacy trials will begin in 2014 to evaluate the current hybrids. Check this Handy BT Table to see if your corn variety controls for corn borers.